2014 was an intensive and exciting year, in which ARC was pleased to deliver a number of regional trainings on accessing UN mechanisms, co-facilitate strategic civil society consultations to help articulate clear expectations for the UN, participate in advocacy to secure the successful adoption of a new SOGI resolution by the Human Rights Council, and produce two evaluation reports on key developments at the UN and in our own work over the past 10 years. 2015 promises to be equally exciting, and ARC will be restructuring to maintain our active engagement in building upon these achievements. Our January newsletter reviews key activities in recent months and looks forward to some of the projects which lie ahead. ARC Co-Director John Fisher participated in ILGA Europe’s Annual Conference, taking place in Riga, Latvia from 9-11 October 2014. The conference brought together hundreds of LGBTI activists from across Western and Eastern Europe to discuss the theme “MOVEment: Leading Sustainable Change”. ARC was pleased to join forces with ILGA and COC Netherlands to present a joint workshop on accessing UN mechanisms. The workshop also provided an opportunity to launch our new evaluation report assessing SOGI and intersex activism and key developments at the UN over the past decade, presented by principal author Dodo Karsay on behalf of the research team. More information about the ILGA Europe conference can be found here. 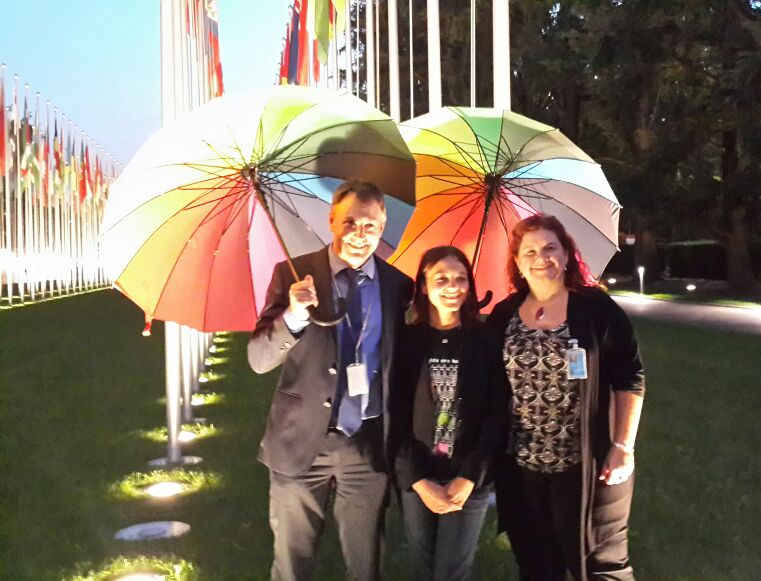 The ARC team attended the ILGA World Conference, which took place in Mexico City at the end of October 2014. Our Advocacy and Communications Manager Sheherezade Kara was pleased to be invited by the conference organisers to speak on a plenary panel on the theme of “the social construction of sexphobia”. She was also happy to reconnect with Global Interfaith Network for SSOGIE at the pre-session where she was invited to speak on a panel on engaging with the international human rights system. ARC also held a workshop on attaining ECOSOC status (moderated by co-Director Kim Vance), and co-hosted a workshop on UN human rights mechanisms with ILGA. The team also took advantage of the many other excellent workshops held on other areas of interest, and participated in our various regional caucus sessions and a pre-session on international organising. We are grateful, as always, for the invaluable opportunity afforded by the ILGA World Conference as a forum for global networking and movement-building. In December, Co-Director Kim Vance travelled to New York City for a number of events surrounding International Human Rights Day (December 10). 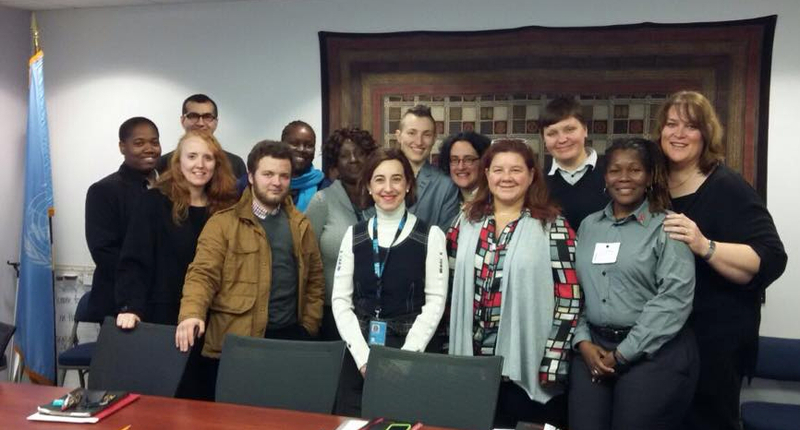 ARC would like to congratulate IGLHRC for their participation in co-organising a fabulous event at the UN focused on families, and facilitating the presence of a phenomenal contingent of activists who had the opportunity to meet with States and UN agencies during the week. ARC found the meeting with UN Women particularly helpful in terms of being able to see the transformation and evolving commitment to LBT issues within the agency, and also firm up support for their participation in a panel during the upcoming Beijing +20 review. ARC was pleased to be invited to a strategic consultation on sexual rights in December, organized by the International Women’s Health Coalition (IWHC). Many key organizations and thinkers working on these issues within international spaces had the opportunity to reflect, assess successes and failures, and map out concrete actions for keeping the a broader focus of sexual rights firmly on the agenda of States and civil society. Members of the Law and Human Rights Mechanisms Committee (including Kim Vance) along with two student interns recently travelled to New York to conduct interviews with key UN personnel. This research, along with other data and analysis, will form the basis of a chapter to be submitted to the final project-related book, co-authored by Nick Mule and Kim Vance, examining how human rights violations experienced by LGBT populations are being addressed by relevant institutions within the UN, and how civil society is engaging with those mechanisms. In addition, ARC contracted two Envisioning-trained videographers from the Caribbean research team to document the last week of activities and developments at the September Human Rights Council allowing us to add a concluding piece of “The Time Has Come” documentary. The videographers also gathered supplemental video interviews and material for a new upcoming documentary tackling the issues of culture, tradition, religion and family and how these discussions play out in regional and international fora. Kim Vance has accepted an invitation to serve on the IASSCS conference organizing committee for the next conference, taking place in Dublin in June 2015. She has attended and presented papers at a number of these conferences over the years, and the conference in Peru in 2007 served as the platform for a Latin American launch of the Yogyakarta Principles. Along with the conference organizing, she co-submitted an abstract with lawyer/researcher Monica Tabengwa and Justice Monica Mbaru entitled “Cultural discourse in Africa and the promise of human rights based on non-normative sexuality and/or gender expression”. The 27th session of the Human Rights Council (HRC or “the Council”) took place from 8-26 September 2014 at the United Nations in Geneva. The key development at the session was the adoption of the second United Nations resolution on “Human rights, sexual orientation and gender identity” (A/HRC/RES/27/32). Tabled by Chile, Uruguay, Brazil and Colombia, and cosponsored by 46 additional States, the resolution requests the High Commissioner for Human Rights to update the 2012 study on violence and discrimination on the basis of sexual orientation and gender identity (A/HRC/19/41), with a view to sharing good practices and ways to overcome violence and discrimination. It expresses grave concern at acts of violence and discrimination in all regions of the world committed against individuals because of their sexual orientation and gender identity. The updated report is due to be presented to the HRC at its 29th session in June 2015. The Council adopted the resolution by a vote of 25 in favour, 14 against, and 7 abstentions, with support from all regions and an increased base of support since the HRC’s first resolution on the issues adopted in 2011. 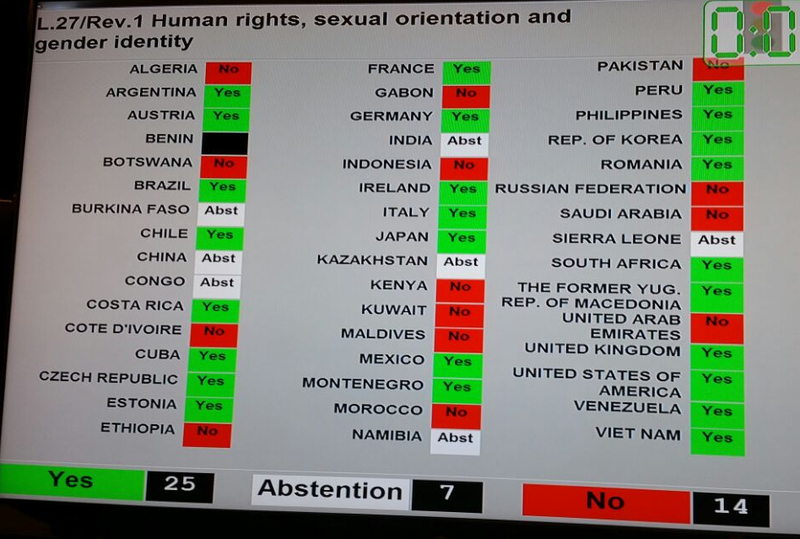 This is the first time a SOGI vote at the HRC has been adopted by an absolute majority. The official text of the resolution is available in all 6 UN languages here. 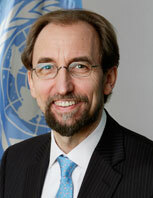 The Council interacted for the first time with the new High Commissioner for Human Rights, Mr. Zeid Ra’ad Al Hussein. In his inaugural statement to the Council, the High Commissioner stressed that there can be no justification ever, for the degrading, the debasing or the exploitation of other human beings on the basis of gender or sexual orientation. A total of ten panel discussions were held, including on the right to privacy in the digital age, protection of the family, and the annual discussion on the integration of a gender perspective. Working group reports from the 18th session of the Universal Periodic Review (UPR) were adopted by the Council for the following 14 countries: Norway, Albania, Democratic Republic of the Congo, Côte d’Ivoire, Portugal, Bhutan, Dominica, Democratic People’s Republic of Korea, Brunei Darussalam, Costa Rica, Equatorial Guinea, Ethiopia, Qatar, Nicaragua. There was strong civil society engagement throughout the session, both in Geneva and in capitals. ARC and ILGA each held side events on SOGI issues, and ARC, ISHR and Article 19 organised a panel discussion on the theme of traditional values and the universality of human rights. The 20th UPR session took place from 27 October to 7 November 2014. States under review included Italy, El Salvador, Gambia, Bolivia, Fiji, San Marino, Kazakhstan, Angola, Iran, Madagascar, Iraq, Slovenia, Egypt, and Bosnia & Herzegovina. 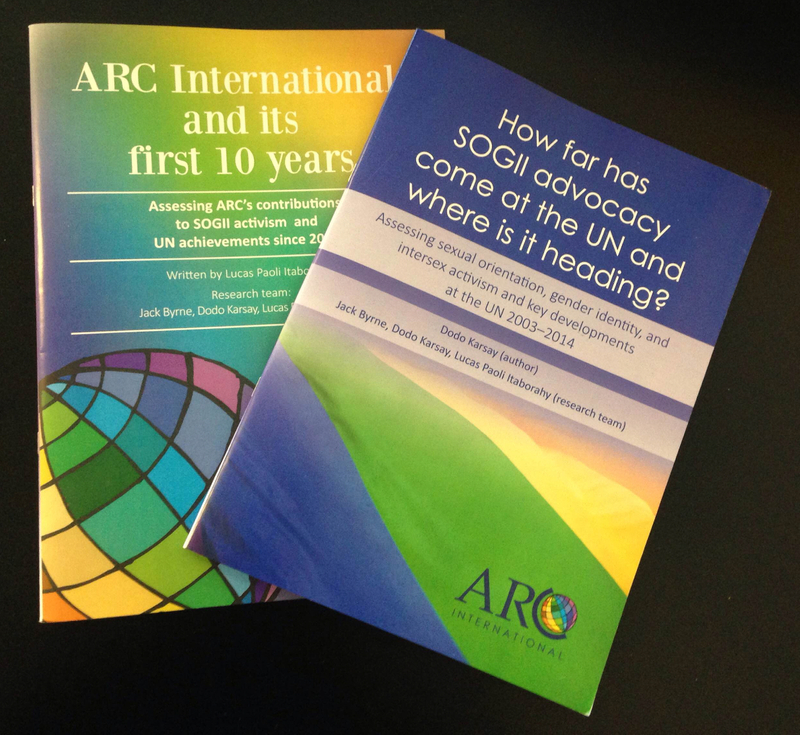 As part of our commitment to community dialogue, self-reflection and strategic analysis, ARC commissioned two external evaluation reports in 2014: one assessing SOGII advocacy at the UN over the past 10 years, including challenges, successes and next steps, and one assessing ARC’s own role, including positive contributions, areas where our work could be strengthened and possible future directions. We are very grateful to the research team: Jack Byrne from New Zealand, Dodo Karsay from Hungary and Lucas Paoli from Brazil, as well as to the more than 100 people (including community-members, allies, diplomats and UN staff) who contributed to the two projects by sharing their views through survey responses and interviews. We look forward to engaging in dialogue on how the findings can contribute to strengthening global LGBTI advocacy in the years to come. The reports are available on our website in English, French and Spanish here. The beginning of a new year can provide an opportunity for reflection and growth. With the passage of a new SOGI resolution in September 2014, the publication of our two reports at the end of 2014 (which allowed for a process of reflection on goals, accomplishments and future directions), and changing landscape in Geneva, staff have been engaged in a process to examine ARC’s work and future directions. With Sheherezade deciding to move on from the organization and pursue new opportunities for professional growth outside of Geneva, and John accepting a position as Geneva Advocacy Director or Human Rights Watch, the current Staff Team, along with the Board of Directors, have crafted a restructure plan for the organization. This plan envisions a continuation of many of the core elements of our work that act as a “bridge” between the UN and activities on the ground, but with a significant shift toward implementation around some of the key international developments in the last 10 years, and capacity enhancement with communities engaging with those developments. The Board of Directors wishes to take this opportunity to express its heartfelt appreciation to John and Sheherezade for their years of dedication as they move on to new endeavours. We are in the process of recruiting for two new positions, a Geneva Director and a Communications Officer (part time). For more details about ARC’s restructure plan, including staff changes, please click here. To view our vacancy announcements (and share them with your networks!) please visit this page. The 20th UPR session is taking place from 19-30 January 2015 at the United Nations in Geneva. States under review include Kyrgyzstan, Kiribati, Guinea, Lao People’s Democratic Republic, Spain, Lesotho, Kenya, Armenia, Guinea-Bissau, Sweden, Grenada, Turkey, Guyana and Kuwait. The 28th session of the HRC is due to take place from 2-27 March 2015 at the UN in Geneva. While no SOGI specific initiative is expected, the four-week session is again expected to be busy, starting with the High Level Segment, followed by interactive dialogues with the High Commissioner and Special Procedures (including on torture, human rights defenders, freedom of religion, and cultural rights), and adoption of reports from the 20th UPR session. The session will also see negotiation of a broad range of resolutions, opportunities to highlight thematic and country-specific issues of concern through general debate, and awareness-raising through a number of relevant side events. March 2015 marks the 20th anniversary of the Beijing Women’s Conference and thousands of activists and States will gather in New York to mark this event and engage in dialogue around the Platform for Action and how far we have come (or not) in the last 20 years. ARC, along with key partners, have been discussing ways to engage in these meetings and have put together a plan for a couple of civil society events, along with a strategy for encouraging State and UN Agency-sponsored events during these important meetings. cheapcarrent.xyz We will be launching and discussing our 10-year evaluation report on one of the panels. Farewell for now from our current staff composition.